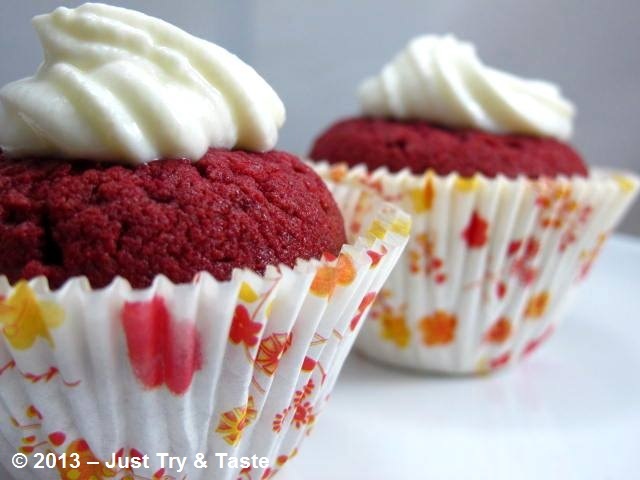 Red velvet cake with a dark red, bright red or brownish red. Traditional version of this cake was made as a cake layer (layer cake) and given a cream cheese topping or icing roux. reddish color produced food is added to the dough. 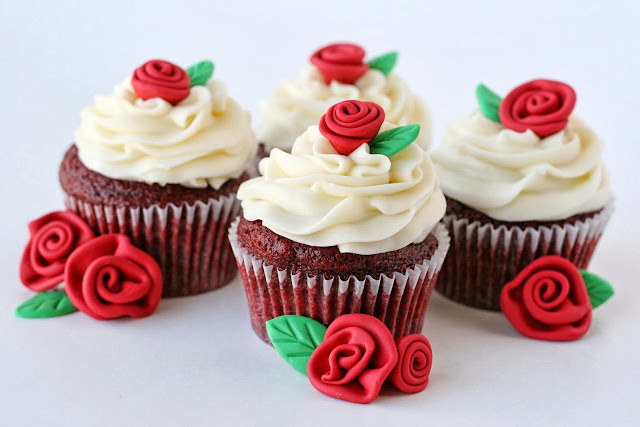 Materials commonly used to make red velvet is buttermilk, butter, flour, cocoa powder, beet root and red food coloring. James Beard's American Cookery in 1972, describes three types of red velvet cake, each of which is different from the composition of fat and butter, and vegetable oils are used. 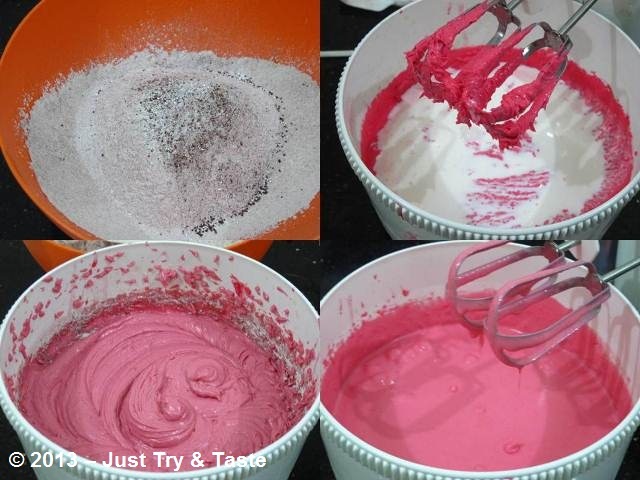 The three types of cake are all using red food coloring, but the reaction of acidic vinegar and buttermilk seems to make the red color anthocyanins contained in the cocoa powder becomes more prominent, while also keeping the cake to keep it moist, fluffy and light. Before the chocolate powder type 'Dutch Processed' introduced more common red displayed. 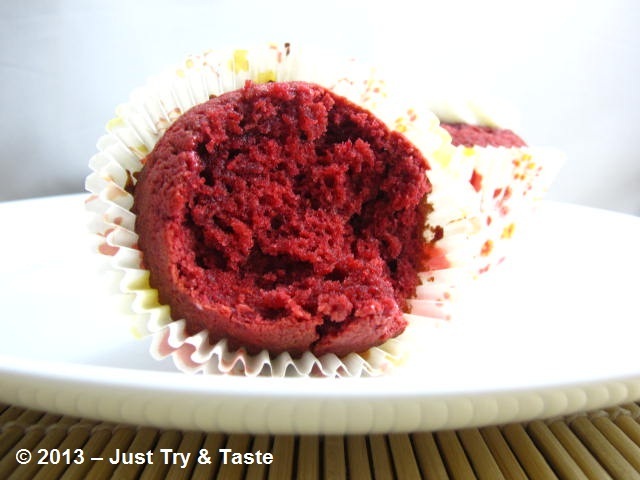 The addition of cocoa powder to create a natural dark red color which might be the reason why the cake name 'red velvet' as a cake called 'Devil's Food' and other similar snacks. Back to the cupcakes that I posted this. 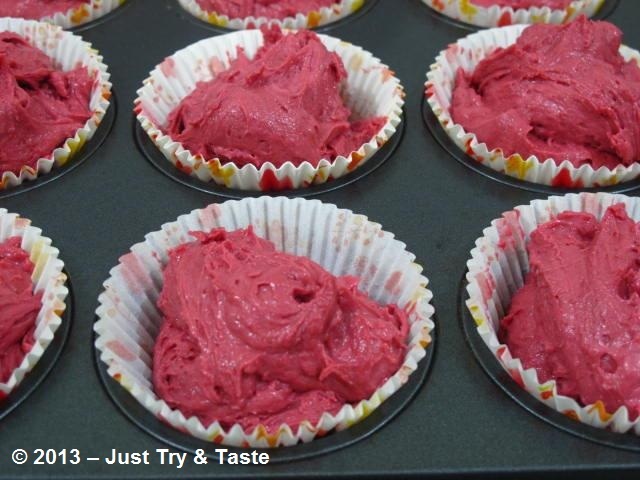 To make these cupcakes very ordinary wet and dry ingredients separated out and mixed separately, then after all the wet ingredients to dry ingredients such as whipped then flour and friends included. You can use whipped butter with sugar prior to development, or useby melting butter (can be replaced with margarine and vegetable oil) and mix it directly with eggs and other ingredients using a mixer. As described in the paragraph above, this cake using a white vinegar reacts with the buttermilk will make the color became dark brown and reddish powder. It also makes the cake becomes more soft, light and moist. For buttermilk, because it is difficult to look at Indonesia, then make buttermilk own by mixing 250 ml milk with 1 tablespoon white vinegar (can be replaced with lemon juice / lime). liquid milk with heavy cream cake to taste more kick. One more thing if you want to make this cake, cupcake papers 3/4 high content of paper so pretty cake rounded and do not bake it until the surface of the cake is too dry, bake for too long will make it less moist, the texture becomes too dry and crumb. Use a good quality food coloring, because this cake requires a dose of dye is enough to make out with a beautiful red color. 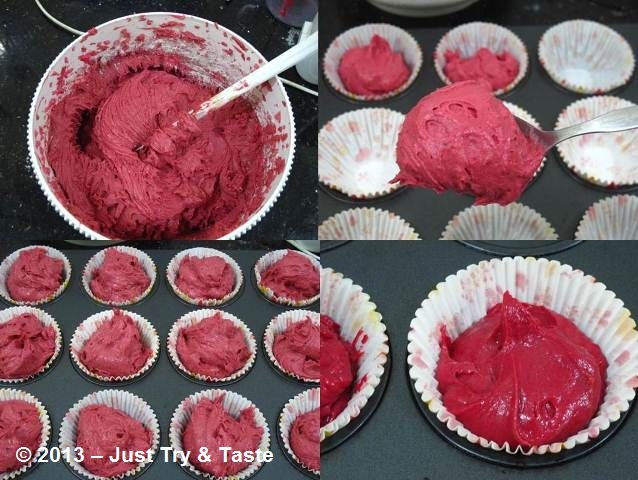 You can use a natural red dye such as red beets if reluctant to deal with synthetic dyes. For texture, this cake moist, soft and light but according to my own taste is not too special. Unlike my original shadow. Although moist and tender but less creamy for my tongue. Next time if I would make it again, I would try to enter the portion of cream cheese into it, might be able to boost the taste. If you are interested, the following recipe and manufacturing process yes. Prepare the oven, preheat at a temperature of 165'C. Place the grill rack in middle of oven. 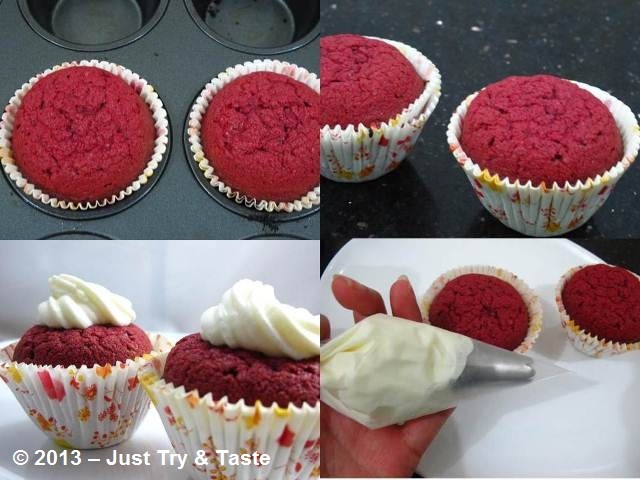 Prepare a baking sheet cupcake / muffin, line it with cupcake papers. Set aside. Prepare a large bowl, sift flour, cocoa powder, baking soda, and baking powder. Set aside. Prepare a mixing bowl, put the butter and sugar, beat until mixed well with . Add the eggs, heavy cream, red dye, vanilla extract, salt and vinegar, shake with moderate-to-average speed and thick. Reduce the mixer speed to be the most low. Enter the flour gradually while continuing to be shaken until well mixed. Turn off the mixer. Do not be too long shuffling if flour had been entered into the dough as it will make the cake becomes hard. 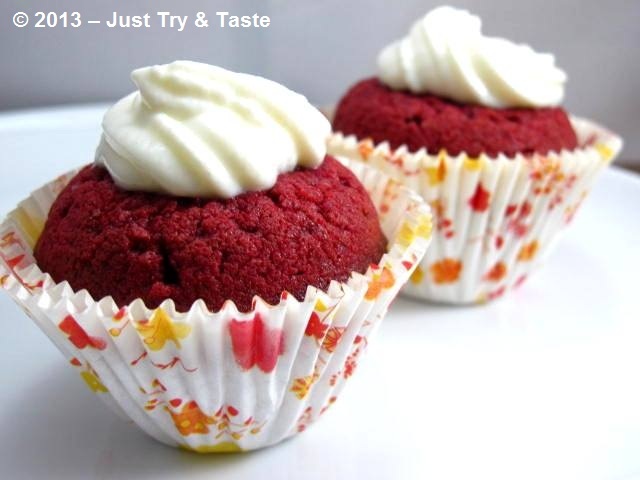 Put the mixture into a bowl cupcake, fill the dough to the bowl as high as 3/4 high. Bake in the oven for 20-25 minutes, circling the pan during baking so the cake cooked evenly. If the surface of the cake looks start to harden yet still middle of the oven, test with a toothpick, if the inside is still moist roast back in a minute. Note: do not be too long to bake until browned surface of the cake, the cake was dry and not moist. Remove cake from pan and let cool on a wire rack to cool completely before frosting sprayed. 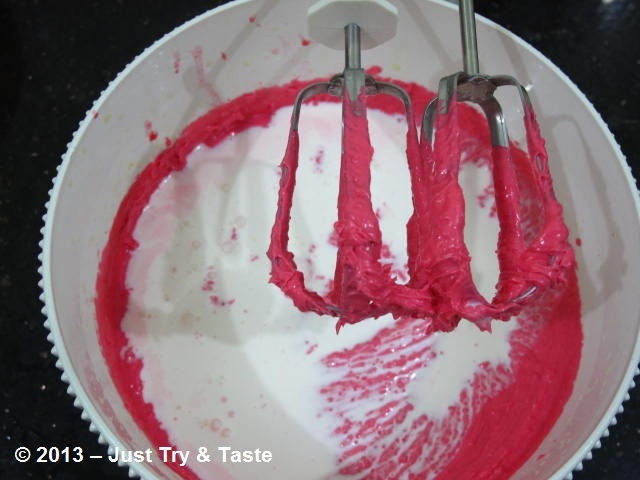 Prepare a mixing bowl, put cream cheese and butter, beat with a mixer on medium speed until white, fluffy and light. Approximately 2-3 minutes. Reduce the mixer speed to be very low, enter the powdered sugar and beat on low speed until well mixed. Increase the mixer speed to medium, beat again for 2-3 minutes. Enter the vanilla extract and beat until well blended. Turn off the miser, put cream cheese into a plastic triangle with the tip of a plastic syringe flower motif. 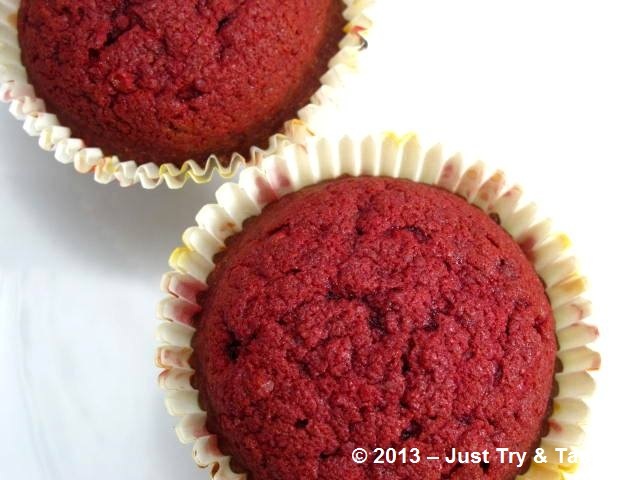 0 Response to "Red Velvet Cupcakes with Cream Cheese Frosting & Happy Valentine's Day 2015"